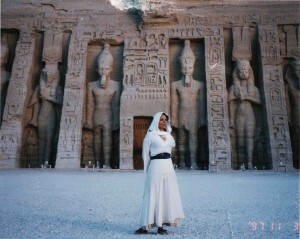 Our next tour to Egypt is set for April 2012. We were suppose to go this past March but given the events of this year, we got derailed because of the Arab Spring and had to re due our itinerary. 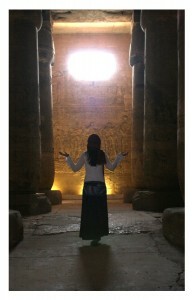 The events that transpired this year in Egypt were a big surprise and I hope the Egyptian people benefit from it all. I feel it is a positive effort. Whose going on Delilah’s Egypt Tour? 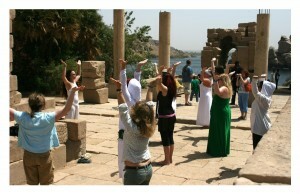 Belly Dancers, family friends and anyone interested in Egypt who wants to see it from a magical point of view. Our new itinerary is all on line and about half of our group is still on board. We lost a few travelers because they couldn’t get all the time off for 2012. Darn! However 2 new people are signing up because they can get the time off in 2012 so, there you go, never can tell what’s going to work out. Things are turning around again and tourism is returning slowly. I have talk to friends who have gone and they said they were glad they went at such a historic time. All reports are pretty fantastic because the sights are not at all crowded . That is the preferred way to visit them (especially ifwe want to do some movement meditations in these sacred spots and not bother anyone. We are still a long way out from April 2012. I’m getting inspired these days! I’m starting to see some cosmic energy lining up. Recently I’ve been totally addicted to all the Egypt documentaries I can watch on net flix on my computer. One set is the 5 part documentary series “Pyramid Code”. OMG! How Fascinating. . . .A bit controversial, but very exciting. You can The Pyramid Code it on YouTube but it’s best on DVD. I got some very excited news that Velaria (who came on my last trip to Egypt in 2008). She is signing up to come on the next one in 2012. She’s been visiting me this week in Seattle and I turned her on to the “Pyramid Code” documentaries. We were both taken by a speaker on the program; an Egyptian man named Dr. Abd’el Hakim Awyan. He was noted as a Mystical Wisdom Keeper. He grew up on the Giza plateau and is a descendent from the Awyan tribe that claim to be the indigenous keeper of the ancient Al Khemitian (Egyptian) wisdom tradition. They claim to have been the guardians of area for centuries. Unfortunately he passed on recently. I would love to have met him. I understand his daughter and a son are following in his foot steps. THUS it is my intention to see if I can add her to our itinerary. Maybe she can come and give us a talk at some point on our journey in 2012. Yes! Over coffee this morning Veleria and I have been reminiscing about our last trip and coming up with ideas for this coming trip. She explained she was saddened by the amount of garbage in some of the more remote sacred sites. She said she wished we could help in some sort of way by maybe becoming a volunteer clean up crew. If we had some sort of pool nets we could get the plastic water bottles left (most likely by tourists from all over the world out of the spring at the temple of Abydos. If we had gloves and garbage bags we could cart litter out of and improve the sites. Hmm? I thought for a few moments and 2 things occurred to me. I would hate to make the Egyptians feel insulted by our demonstration. Like we were making a comment on the Egyptians not having a clean house. Hmmm? We cannot hope to make a very big difference really. But then I think for each of us personally it would mean something profound as a ritual of recognizing the sacred value of these sights from the perspective of our global humanity. A ritual of cleansing, humbling and compassion. We leave our footsteps and our breaths there that little by little erode these monuments and the least we can do is make an effort to undue a little of the tourist impact.These monuments are our world human heritage. On a cosmic consciousness scale this would mean a lot energetically. It couldn’t hurt for anyone to see a few Americans get down and humbly pick up some trash either. So I am going to have a list of things for Mohammad to have on our bus. A pool scoop, trash bags and I’ll bring a box of plastic gloves. Anyone who feel inclined can fill a bag of garbage and feel they made a difference even if it is very small. I am going to also have him contact the daughter of Dr Awyan. If she is living in Egypt maybe she can come give us a talk! I love to hear from those who are Ancient Egypt buffs like me.